For the 357th time, I’ve discovered that green smoothies are great. And they make you feel good from the inside out. After gulping down a big glass of green goodness, I almost feel like I’m a better person somehow. Maybe it’s the green color that somehow relates to being healthy, or it’s the fact that I’m prepping a drink to nourish myself. I usually have green smoothies and cold-pressed juices during the summertime, as in the winter I’m drawn towards more ‘warming’ things. But given my recent appetite for chocolate and other sweet treats, green smoothies have been on the menu just to balance things out a bit. So I thought I’d share one of the things I’ve made, in case you’re in the same mindset as I am! I made this Green Power Smoothie with Chia for an Instagram campaign with Järvikylä earlier this week (there’s a giveaway going on too, check out the post! ), but I felt like blogging it too. Since lying here on the couch under a comfy blanket with my laptop is a lot nicer than for example cleaning, which is on my agenda for today as well. But first: smoooooothies! 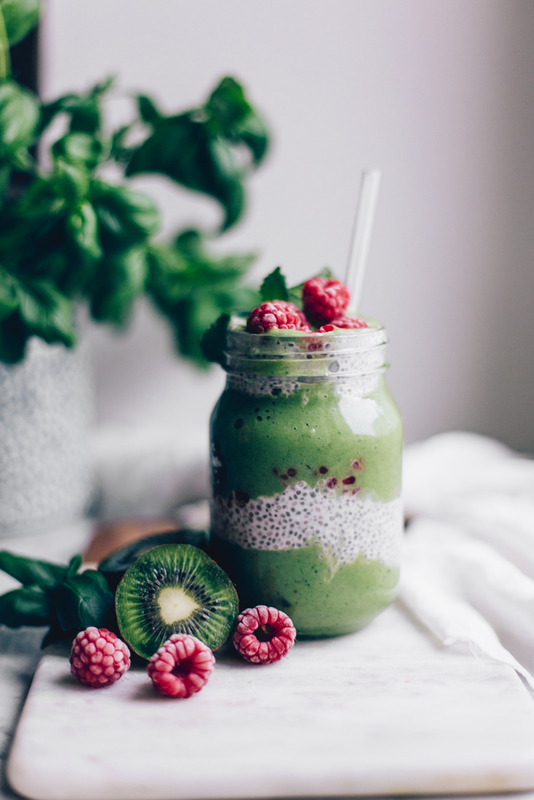 This is a really simple treat, but layering the smoothie with chia pudding makes things a bit fancier and a lot more filling too. I like to have a smoothie either in the morning or in the afternoon as a snack, or if I’ve invited friends over for brunch, these are a great way to spoil (and nourish) your companions as well. 1. Start by making the chia pudding. Mix all ingredients in a small bowl and allow to thicken for at least half an hour until you have a thick pudding. 2. Once the chia pudding is ready, prepare the smoothie. Slice the banana and scoop the avocado to a blender and add the remaining ingredients. Blend until smooth. 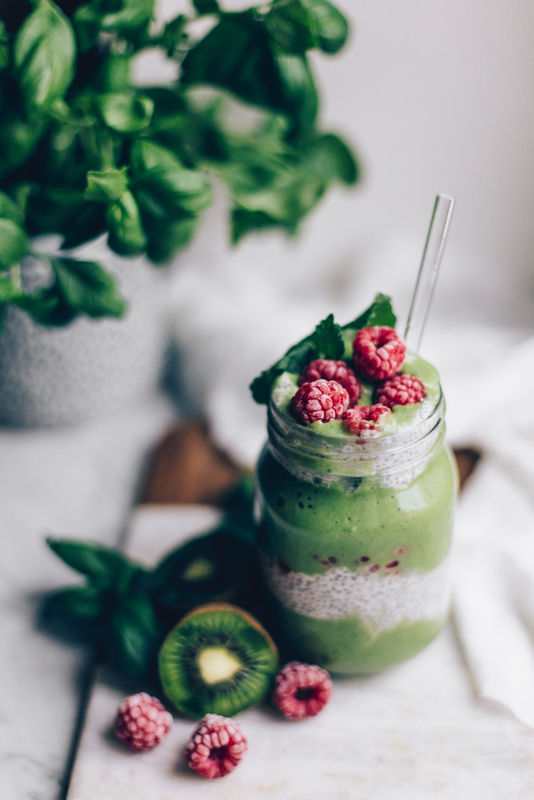 Pour a bit of the smoothie into a tall glass, add a layer of the chia pudding and then fill the glass with the rest of the smoothie. Top with the raspberries, and enjoy! Tagged breakfast, herbs, nut free, rawfood, smoothies, vegan. In need of some inspiration? With flowers, food, styling, and photograpy, our workshop called A Winter Gathering is just for you! These No-Rice Nori Rolls w/ Marinated Tofu & Veggies are super easy to make, and they're the perfect thing to satisfy your sushi cravings.